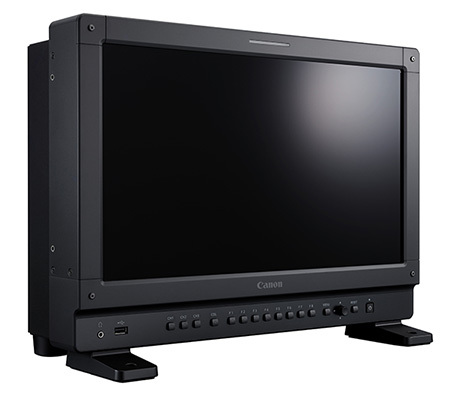 The Canon DP-V1711 UHD 4K Reference Display is a compact and rugged display. It supports UHD (3840 X 2160) and 4K signals for use in broadcast and cinema workflows where high mobility is needed. The innovative Canon-designed white LED backlight with its IPS panel facilitates a wide-viewing angle, and the anti-glare coating helps improve on-set visibility. It also features a specially developed image-processing engine to help produce uniform brightness. The DP-V1711 utilizes the same high image quality technology found in Canon's other reference displays so you can rely on a consistent look throughout the entire workflow, using any combination from the Canon Reference Display line. The DP-V1711 works with a variety of workflows, including a link up with ARRI ALEXA SXT camera systems for cinema productions, while its size and full feature set help make it a superb choice for broadcast productions both on set and in broadcast vans and studios. Supporting broadcast/digital cinema EOTFs, as well as Canon's own proprietary Canon Log/2/3, and the latest HDR EOTFs, Hybrid Log-Gamma (ITU-R BT.2100) and SMPTE ST 2084, the DP-V1711 is also packed with an abundant selection of functions for supporting HDR production. The DP-V1711 is also equipped with 12G-SDI terminals. As a result, 4K60P video that up till now has been received on four SDI cables can now be received on one SDI cable, thus reducing the amount of required shooting equipment and materials. Featuring an aluminum frame design for rigidity and strength, the reference display weighs less than 18 pounds. Importantly, its EIA 19” rack mount compatibility (7U) means it can replace existing FHD displays and is considerably easier to install than other larger 4K displays. It can be powered by 100-240V AC or 12VDC for additional flexibility. For more information about the DP-V1711 UHD 4K Reference Display, contact us at display@cusa.canon.com. 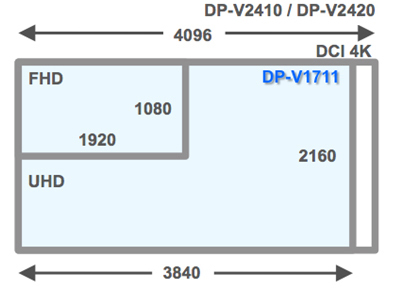 The DP-V1711 is an ACES Compatible product. Click here for more information. The DP-V1711 UHD 4K Reference Display is perfect for new or retrofit applications in broadcast studios and mobile production vans. The DP-V1711 fits inside 19" racks making it an excellent choice for broadcast vans that are subject to space and weight restrictions. The DP-V1711 is 17", perfect for many broadcast applications. The DP-V1711 is also equipped with a REMOTE (parallel mode) terminal, which means that it can be controlled remotely by a switcher or other device. This helps make this display indispensable for supporting 4K in existing outside broadcast vans. The DP-V1711 4K Reference Display can perform 4K RAW format image debayering internally*, without the need for any external debayering equipment. This enables a sophisticated, yet simple 4K production-monitoring environment to be set-up with minimal wiring connections and as a result, greater mobility for the EOS C700, EOS C500/C500PL and EOS C300 Mark II digital cinema cameras. When the DP-V1711 4K Reference Display is connected to an EOS C700, EOS C500/C500 PL or EOS C300 Mark II digital cinema camera, the 4K RAW format image de-bayering process occurs in the reference display. There is no need for a 3rd party de-bayering unit. This allows you to display 4K/60p content with a single 12G-SDI cable. It is also possible to use a recorder that does not include a de-bayering function by passing the signals straight through the DP-V1711 display to the recorder. Additionally, the DP-V1711 can display 4K/60p content from any 4K camera with a single HDMI cable- provided that camera supports 4K/60p output connection. The DP-V1711 UHD 4K Reference Display supports broadcast/digital cinema EOTFs, as well as Canon's own proprietary Canon Log/2/3, and the latest HDR EOTFs, Hybrid Log-Gamma (ITU-R BT.2100) and SMPTE ST 2084. Providing various EOTFs in this way powerfully supports on-location confirmation of video. Up to eight 1D-LUTs created separately can also be imported. The DP-V1711 UHD 4K Reference Display supports split-screen display of HDR and SDR signals. 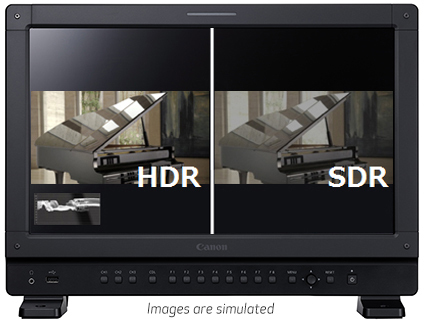 Since video can be displayed simultaneously on the left and right screens, differences in luminance ranges and gradation/brightness can be compared at a glance, thus allowing HDR shooting to be conducted with more confidence and efficiency. Various other features can be combined to make HDR production easier to perform: Range Compression Display according to specific production applications, Clipped Display, Camera Information Display, and Waveform Monitor Display. The DP-V1711 fits inside 19" racks making it an excellent choice for broadcast vans that are subject to space and weight restrictions. 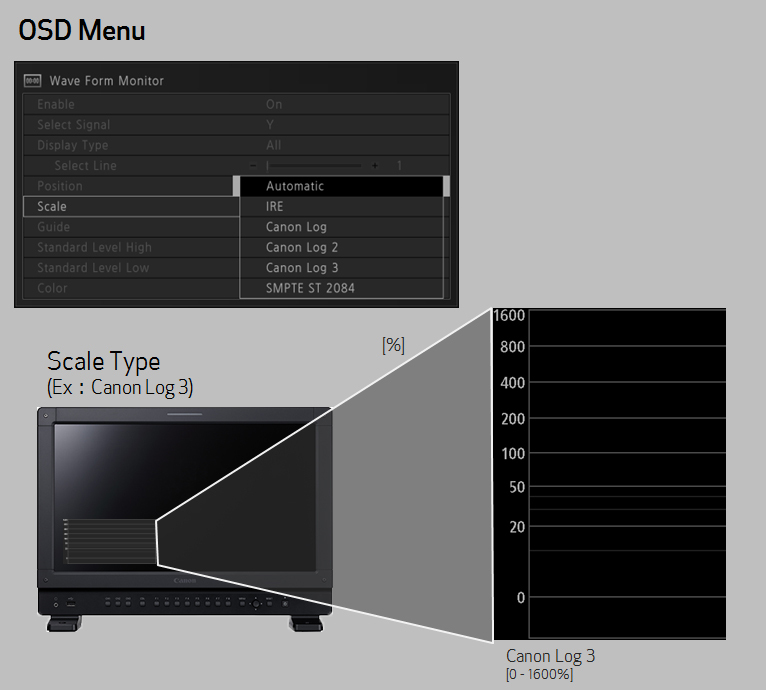 The waveform monitor can be selected to display HDR scales (e.g. 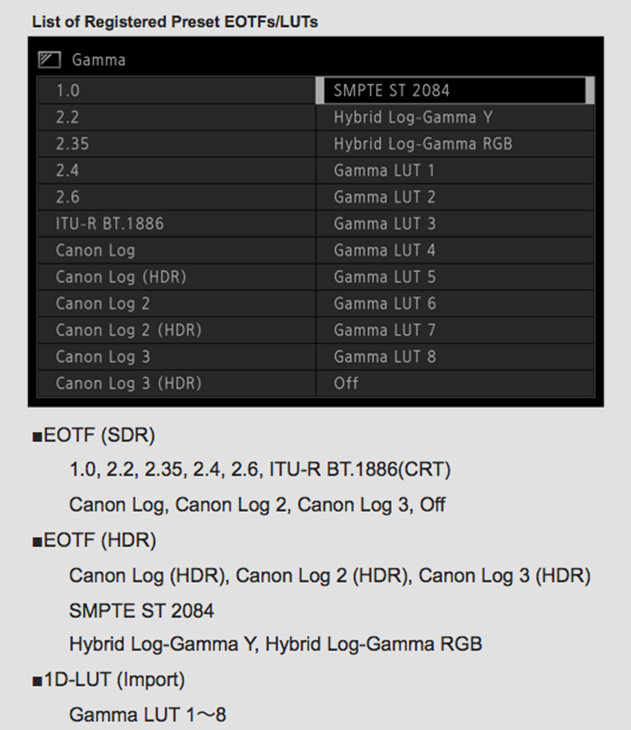 SMPTE ST 2084 nit) or Canon Log (%) for maximum flexibility in HDR production. 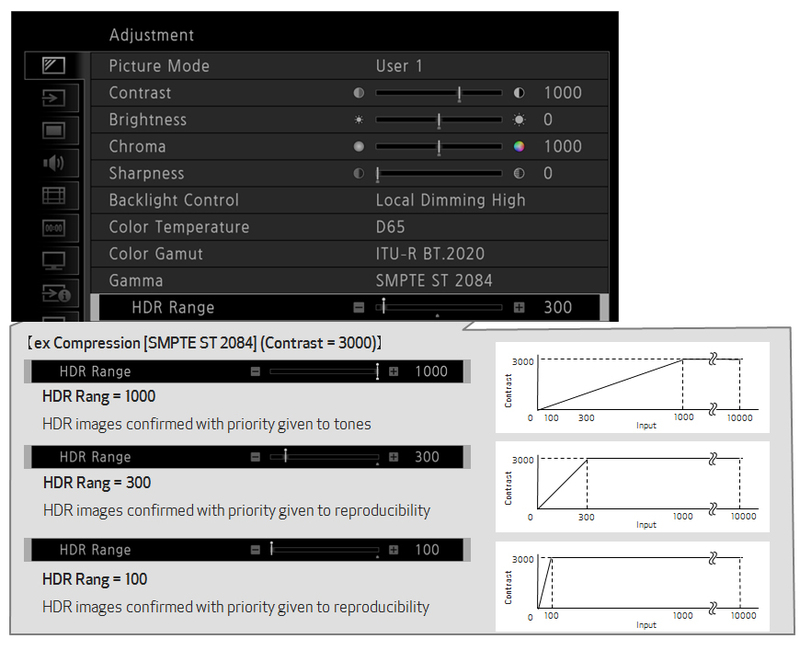 Variable adjustment of the HDR range is possible to suit specific applications. For example, the dynamic range of the HDR standard signal or LOG signal can be displayed to fit within the luminance supported by the display main unit (range compression), or required actual luminance parts of the range can be displayed with the highlight range area excluded (range upper limit clipping). Desired values can also be registered in advance to function buttons or channel buttons. This lets you call up respective HDR standard videos for confirmation by one-touch operation. Metadata information (color gamut, gamma, maximum luminance, average luminance maximum value of content) from PCs for HDMI-compatible video editing and Blu-ray players, cameras and other devices can be displayed on screen. This is useful for appropriate HDR productions since videos can be monitored while confirming the HDR information at the same time. The DP-V1711 UHD 4K Reference Display provides a black level superior to older CRT displays. What's more, by ensuring accurate gradation precision afforded by liquid crystal displays, a higher black reproduction can be achieved compared with that of CRT displays and OLEDs, on which black defects are likely to occur in the shadow areas, thus helping to improve video production quality. The Camera Link-Up feature of the reference display allows seamless linking to the ARRI ALEXA SXT camera system, providing for increased flexibility on-set for camera assistants and DITs. An image quality link-up function automatically switches the image quality of the display based on the camera's meta information. This function is established while the ARRI Camera system is connected to the DP-V1711. The fact that the image quality settings are linked automatically for the camera and for the display means that setting errors can be minimized. Presetting by Cinema EOS System's Canon Log/Canon Log2/Canon Log3 and the ARRI Log C video display are also supported. Log C is preset to the main unit menu. So, all you have to do to check image quality is connect to the camera without having to go through the trouble of adding on any special LUTs. The DP-V1711 UHD 4K Reference Display allows you to set multiple LUTs (8) for each picture mode, same as the DP-V2410 and DP-V2420. 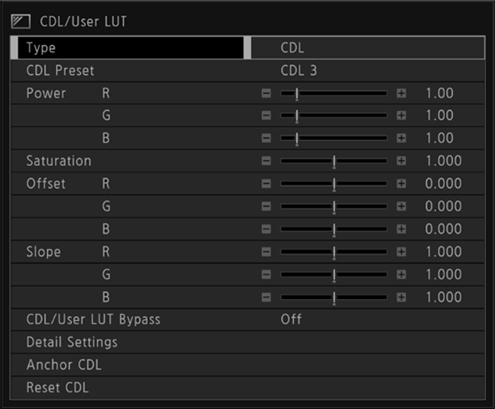 As a result, users can select up to eight LUTs in one picture mode for improved convenience. In addition, presets from CDL1 to CDL15 and a CDL details setting screen have been added. Users can also change the name settings for CDL1 to CDL15. The display has a Direct-type white LED backlight and IPS liquid crystal panel in order to achieve the high-image-quality performance that is optimally suited for the shooting locations. In addition to satisfying a multiple number of the latest broadcast standards such as ITU-R BT.709, EBU and SMPTE-C as well as the latest DCI-P3 digital cinema standard, it also meets the next-generation standards of ITU-R BT.2020 and ACESproxy, the transmission standards of ACES whose color management standard is advocated by AMPAS. The DP-V1711 UHD 4K Reference Display achieves the same level of high-accuracy uniformity as the DP-V3010, DP-V2411 and DP-V2421 reference displays. By incorporating a proprietary image processor developed for use in displays to enable fine-tuned adjustments, any color and luminance unevenness on the screen can be prevented and high-accuracy uniformity can be achieved. The high-accuracy display processor enables accurate gradation displays. The DP-V1711 features a panel with a 3840 x 2160 resolution and a 16:9 aspect ratio. It can display signals compliant with the digital cinema and high-definition TV broadcast standards on a dot-by-dot basis in exhaustive detail. It makes its three expanded display modes available for 2K or full-HD video productions as well. In this way, it can be used as a FHD/2K/4K display in a wide range of applications, and it contributes to improving the efficiency of 4K/full-HD video production workflows. The DP-V1711 is equipped with three types of screen scaling functions, including the Canon Shape Tracing technology™ an original shape-tracing technology that helps to minimize artifacts on images scaled on the DP-V1711. Using the Canon Shape Tracing technology, the DP-V1711 detects the angles of hard edges and selects an appropriate interpolation to help provide smooth diagonal lines and optimal image rendering, further extending the display's application during location/studio shoots and within color-grading, DI, CGI, VFX and other post-production workflows. 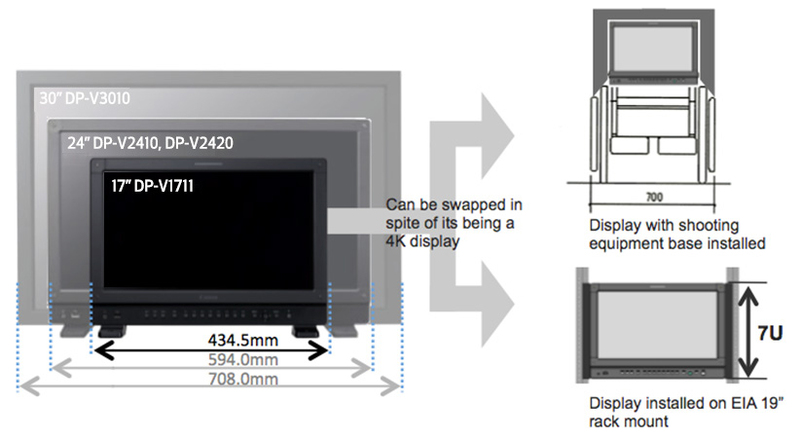 The functions of the DP-V2410 UHD 4K Reference Display have been carried out to allow selection of enlargement ratios (4x, 8x) and display at arbitrary positions. And, the provision of zooming modes 1 to 3 means that enlargement ratio and display position can be preset, thus improving ease of use. The DP-V1711 features a peaking function that enables users to check the focus state at a glance. With high-definition video productions, this helps with the focus adjustment to bring the subjects into focus. The DP-V1711 features a mode in which the display's fan is shut down for a prescribed period of time during camera shooting*. This mode can be linked with professional-use cameras, such as the cameras in the Cinema EOS System, to shut down the fan during recording. It can be useful when the noise of the fan would disturb the atmosphere in a studio or other quiet shooting location. The DP-V1711 comes with Canon's proprietary control system that is used to correct the fluctuations in luminance and help ensure accurate, stable performance over time. In order to achieve high color uniformity, each DP-V1711 undergoes a high-precision calibration process before shipping from the factory. External calibration allows users to maintain factory settings as well as make adjustments for specific display applications. The DP-V1711 achieves the same high level of stability as the DP-V3010/DP-V2410. 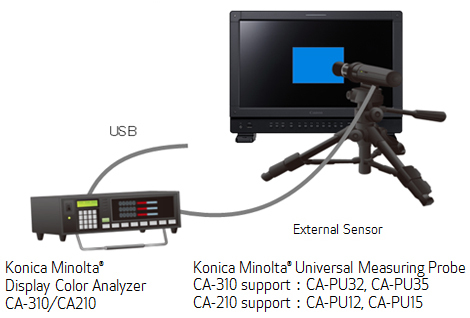 In cases where color shifting or other problems have occurred due to the deterioration experienced over the years, accurate corrections can be made using the external sensor (CA-210/CA-310 from Konica Minolta) without having to use a PC. While carrying over the proven operability of the DP-V2410 UHD 4K Reference Display, Canon has reduced the size of the OSD menu displays to the size that is optimally suited for the operation range. The information is easy to read yet does not really obstruct the display of the images on the screen. Specific functions can be registered to the function buttons in accordance with the intended applications. These functions can then be accessed immediately at the touch of a button. The control area with its function buttons factors in different scenarios for shooting at many different locations, and it is extremely easy to use. The buttons and jog dial are laid out in the same positions as they are on the DP-V2410 display. The labels and buttons on the front panel control area are illuminated to enable operation even in dark places. Serial/parallel remote terminals are provided for remote control. This enables the operating situation at the shooting location to be confirmed by the tally lamp, and the display to be remotely controlled from a linked third-party grading system. Power On/Off, tally lamp lighting (green/red/ amber). Channel/picture mode control. The DP-V1711 UHD 4K Reference Display can be powered by a 12 V DC source which allows the display to be used in the field when producing remote segments, dramas and documentaries, for example. The aluminum frame design offers rigidity and strength. The front body design is based on the DP-V2410 display design concept, which offers minimal noise as to not interfere with production work. The display can be installed with optional brackets for installing the rack mount.